Onions: Besides being low in calories and high in Vitamin C and Potassium, onions are chock full of antioxidants. What exactly are antioxidants? Well, every day your body comes in contact with a host of chemical vapors, pollutants, and toxins that would like nothing better than to destroy your cells. Antioxidants fight this oxidizing process by neutralizing or breaking down the bad guys. The more antioxidants you have, the better your chance of fighting them off. Eat onions along with garlic for a one-two punch! Garlic: Like all of our root vegetables, garlic is low in calories and high in nutritive value. Just look in the vitamin aisle at your local grocery store or pharmacy and see how many forms of garlic tablets are available for you to purchase. But why would you want to swallow your nutrition and miss out on the amazing flavor! The mildly pungent taste of garlic lets you know it’s hard at work detoxifying your body and building your immune system. Our garlic is a premium variety that chefs love. Potatoes: Did you know that the recommended daily allowance of Potassium is 4700 milligrams a day? Did you also know that potatoes will help you get to that amount faster than a banana? Potatoes are a wonder food, providing you with energy, low calories, Vitamin C, Iron, and Potassium. Potatoes are extremely versatile too! You can use them in pancakes, bread, roasts, or salads. Potatoes are also very filling, so they can keep you moving full-speed-ahead for hours. You’ll benefit the most by leaving off any added fats or salt. Carrots: For those of us who like dehydrated vegetables when we go backpacking, carrots couldn’t be a better choice. Because they have a high water content, they shrink significantly when they’re dehydrated, and swell considerably when rehydrated. In addition to the convenience on the trail, they are also loaded with fiber, beta carotene, and have just the right balance of starch and sugar to be considered low on the glycemic index while providing exceptional nutrition. Sweet Potatoes: Okay… we did save the best until last. 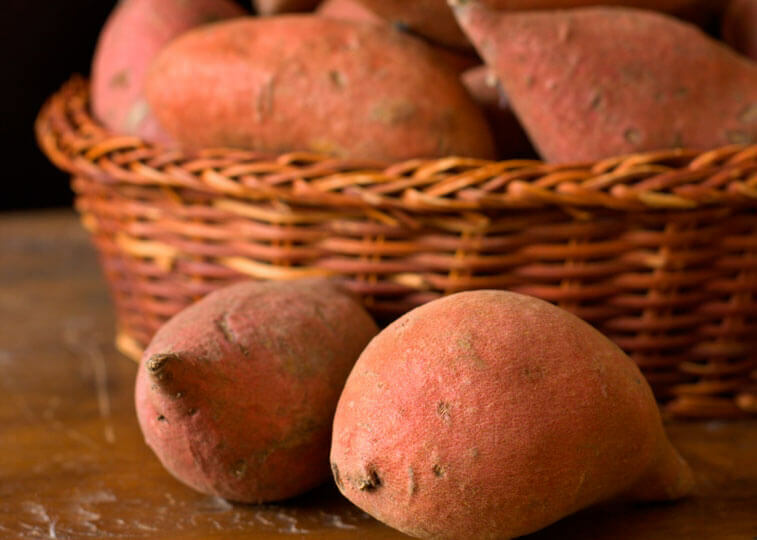 Sweet Potatoes are sometimes called the “Superfood of the world” and for good reason. There is just nothing bad you can say about a sweet potato. They have high Vitamin A and Vitamin C, more Beta Carotene then carrots, antioxidants, and anti-inflammatory nutrients. Sweet potatoes are easy to prepare and easy to enjoy. All the vegetables above are extremely shelf-stable. Although we recommend a two year shelf-life for most of our products, the root vegetables will be eaten and gone long before they could ever go bad. So why not load up on nutrients and live to the max. Rediscover your roots!